Arriving at the tail-end of Phase One, it showcased Shakespearean scene-chewing alongside unapologetic servings of Norse mythology, and generally took big risks in upsetting the established tone and continuity of the Marvel Cinematic Universe right before its first tentpole team-up. The film’s proof of concept comes from the comedic talent (and Herculean pectorals) of then-relative unknown Chris Hemsworth, who portrays the full manspreading bravado of the God of Thunder with just enough flawed personality, that when he is brought low (or, more accurately, brought to Earth) he makes for a remarkably human god. Thor: Then give me one of those large enough to ride! The punchline of this gag is solid, but it’s Hemsworth’s deadpan delivery that does all the heavy lifting. By this point in the film we know Thor, and while he’s occasionally funny, he never jokes, so when he says he plans to ride out of the store on a large domesticated animal, YOU BEST BELIEVE HIM. Thor: Ragnarok would later give Hemsworth bigger comic moments to play with but seeing him do so much with a throwaway line is my highpoint of MCU Phase One. Josh Butler is a writer. You can find him putting together a Grand Unified Theory of Cartoons over at Disney Theory. Nick: I do not think it is too controversial a statement to say that Marvel seemed to struggle with sequels for a bit. When they came to us in the second phase, the reception for Avengers: Age of Ultron was little more than a waft of disappointment, while Thor: The Dark World forgets it’s meant to be entertaining until the final hour or so. It’s where Iron Man got lucky (and Captain America somehow dodged a bullet): Iron Man had already had its lacking sequel. Why focus on Iron Man 2 then? It’s not the film people forget in the Phase One (hello, The Incredible Hulk, a film I shamefully admit I haven’t watched), and it’s not got the feeling of disappointment that came later on, but it’s fair to say it’s seen as an albatross around the neck of an otherwise successful first phase. It’s flabby, it does little that’s new, it doesn’t earn its audience’s love. And yet right near the middle, there is one scene that even now stays in my mind. Now, I should confess here that I have only seen each Marvel film once. To my mind, it’s what makes that first phase all the more impressive: I remember so much. The thrill of the rainbow bridge rushing towards us, Captain America selflessly jumping into a grenade to save his fellow soldiers, the Hulk revealing he’s always angry. Ah! Great moments that live on. Iron Man 2? It gives us strawberries. It’s a throwaway joke, that Tony tries to give Pepper Potts strawberries even though she’s allergic to them, but it is, I think, what redeems the movie. It’s the moment where Tony Stark decides he wants to be the man someone else wants him to be (namely, Pepper), but still isn’t content with being the man SHIELD or the world at large need him to be. He’s a hero, yes, but a hero in progress, doing things in his own time and on his own terms. And he wants to impress Pepper and be the man who keeps her. It’s a tiny moment, gone in seconds, but it speaks volumes about the character that such apparent flippancy hides such hunger for love, and it speaks volumes about the movie that it doesn’t forget to stay true to Tony Stark’s character. The rest of the script sleeps it off and rests too much on its former glories, but for a few lines, a handful of frames; a slither of time wrapped up in a joke? We get strawberries. They may just be the most important thing in the movie. Nick Mellish is an author. Find his short stories and regular misadventures on Nick’s Little Bit of Net. Matt: The MCU is a genuinely strange beast; spearheading changes that have been widely felt but never truly replicated across the entire mainstream cinematic spectrum. It is both Frankenstein and his monster, and retreading the early years of its existence illustrates what would grow into the formulaic weaknesses and the profound staples that have so clearly defined this franchise. With The Avengers being a brilliant culmination of effort, diligence and patience, it is arguably the platform that transitioned the MCU from a compilation of decent action films to a united industry-shifting juggernaut. And yet my favourite scene is something much simpler, that came one year earlier. By 2011, the box office had seen over ten years of superhero blockbusters, but it was only when Captain America came out that I was truly floored by the purity of unabashed goodness. Uncynical, unwavering, uncompromising goodness – a bona fide hero. The moment in question follows a loutish bully laughing during a news broadcast detailing the ongoing events of World War II. The young scrawny Steve Rogers chastises the man and a back-alley conflict ensues. Steve is physically outmatched and stands little hope of winning the fight. Yet he persists. Because he will not back down against injustice. This core principle is one that has been replicated in each Cap appearance but it never wears thin because Chris Evans’ performance is so sincere that you cannot help but believe him and more importantly, believe in him. So, looking back over Phase One of the MCU, I am a little surprised yet completely resolved that the finest moment is not some big action setpiece or a major plot reveal but a skinny kid with a steadfast moral compass, doing the right thing. Matthew Stogdon is a filmmaker and movie critic. You can find his reviews on The Red Right Hand, listen to him on the Sequelisers podcast, and see his work as part of Cheesemint Productions here. Michael: I remember watching Thor and being astounded at its willingness to go all-in on weird Asgardian imagery and characters. My personal favourite comes at the beginning of the film, where Odin turns up in Jotunheim on horseback. And for one brief, glorious moment, the horse rears up and we can clearly see that it has eight legs. Hooray! A cameo from Odin’s horse Sleipnir. Now the reason I gain so much particular joy from this is that it means that, canonically, in the MCU, Loki has shapeshifted into a mare to “distract” a frost giant’s horse and subsequently give birth to an eight-legged horse which he bequeaths to his adopted father. It is at this moment, so early on in the film, that Tom Hiddleston becomes drawn into the world of some very interesting fan art. Michael Eckett is a playwright, writer and podcaster. You can listen to him as part of Comic Book Classroom, and back his comic book Forged on Kickstarter here. Alex: A favourite moment from Phase One of the MCU, you say? I certainly have a few. But, my favourite-ist moment actually comes from one of the MCU’s least regarded offerings. And, technically, it comes after the movie has ended. While I don’t look back on Iron Man 2 especially fondly, I quite enjoyed it when I watched it in the cinema. I was drunk, which might have something to do with that. And, though I don’t actually remember this, I have it on good authority that during the reveal of Mjolnir in the post-credits sequence, I stood up in the auditorium full of people, pointed at the screen and bellowed, “TIS THE HAMMER OF MIGHTY THOR!” at the top of my lungs. Four pints of snakebite and a trough of extra-spicy nachos will do that to a man. I maintain, however, that my excitement came from more than just boozy bluster. As someone who grew up poring over comics from the House of Ideas, the Marvel movies of the early-to-mid 2000s elicited mixed emotions. While it was great to see the heroes of my adolescence projected on the big screen, these cinematic offering lacked the sense of scope and interconnectivity of their four-colour counterparts. Yet in that moment, was the tantalising promise of something greater. I’m don’t know if that promise has ever been fully delivered in the subsequent movies. Yes, Marvel do ‘shared film universe’ better than everyone else out there, but for me, it just doesn’t work on screen like it does in the comics. But there, in that cinema, with that much booze and processed cheese churning through my stomach, the possibilities seemed endless. Alex Plowman is a musician, writer and podcaster. You can listen to him on the Sequelisers podcast, or hear him as part of Monster City. 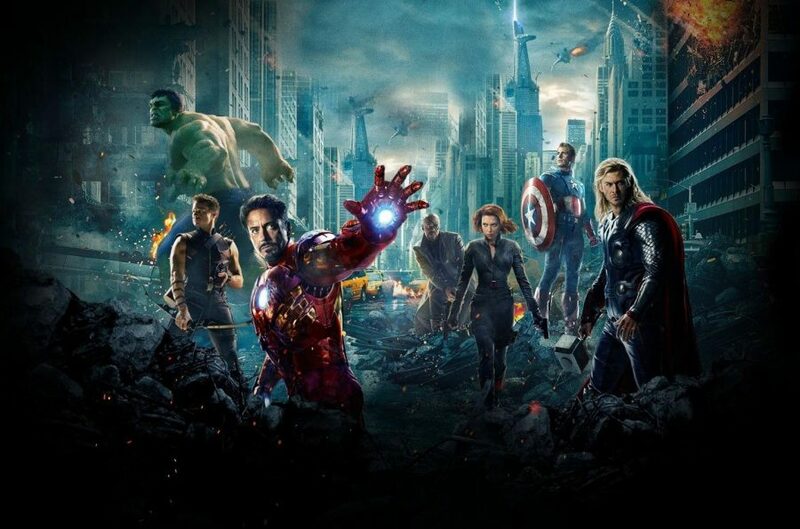 Mike: Six films’-worth of superhero smash-bangery. More than 12 hours of movies. And yet one of the best, most memorable, most heroic moments of MCU Phase One lasts just a few seconds – and poses absolutely no threat to anyone on screen at the time. “You don’t win wars with niceness doctor – you win wars with guts”. So says a typically pithy Tommy Lee Jones after his huffing, growling Colonel Chester Phillips finally loses patience with scientist Stanley Tucci’s insistence that a 90lb asthmatic is the best candidate to be America’s super soldier. But his dud grenade, tossed among the exercising recruits to prove who the real soldiers are, sees all the swole meatheads scamper, leaving Steve Rogers sprawling in the dirt shouting and waving for everyone to get back. It’s a beautiful, persuasive moment. There are no powers at play here – no alien weaponry or flying suits, no gamma-infused muscles or years of deadly assassin training. There is just Steve – a sickly, scrawny Brooklyn kid showing he’ll give up his life in a heartbeat to help others. It’s always got me right in the chest knowing we’re seeing the actual Captain America right here, super-juice in his veins or not. Rewatching the scene for this writeup has given me pause for thought, though. Because not everyone in the exercise area does run from the grenade. Step forward Agent Peggy Carter – a smart, swift tactical mind with years of military training, who also makes to run towards the grenade when it hits the floor, and Steve along with it. Carter’s no green, naive recruit like Rogers – she’s a hardened pro, who immediately assesses the situation and goes to make the same heroic sacrifice. Never mind not rating Rogers – overlooking Peggy as the clear best candidate for the super serum is Colonel Phillips’ real oversight here. Juice Agent Carter up with those gamma rays, and she’d have been punching Adolf Hitler in the face by tea-time. Mike Didymus-True is a writer. You can follow him on Twitter here. Emma-Jane: For me, there’s a single film in Phase One of the MCU that sets the overall tone for the comedy in the entire franchise. Sure, Iron Man has plenty of sardonic quips but before Kenneth Branagh’s Thor came along, humour wasn’t something I personally associated with the MCU. I was initially surprised because it felt like a rarity to be watching a blockbuster fantasy movie that had action, drama and comedy in it. Thor’s anachronistic, verbose Asgardian language, coupled with his inability to fully grasp the social graces and behaviours of the modern day, made for comedy gold. Unlike Cap, who is rather like a bemused grandfather who doesn’t understand kids today, Thor’s mannerisms struck a comedic chord within me. It’s hard to pick my favourite moment because so much of this film makes me laugh. From the pet shop faux pas to escaping his restraints in a hospital, only to be sedated mid-sentence “You are no match for the mighty Th…”. These scenes coalesce with Thor’s culture shock to create excellent, improbable, screwball comedy moments. However, the scene that solidified my love of the MCU’s humour streak was the diner scene. Thor is ravenously eating after arriving on Earth/Midgard, downing a cup of coffee he exclaims, “This drink, I like it.” Darcy barely has time to respond before Thor hurls the receptacle at the ground, proudly demanding “Another!” That transition from pure slapstick to Chris Hemsworth’s sincere but stoic expression and apology never fails to make me laugh. Thor has subsequently developed throughout the franchise and this comedic aspect has continued to dominate both my favourite scenes and his character’s most memorable moments. One need only look at Thor: Ragnarok to see this utilised perfectly. Emma-Jane Corsan is a freelance writer, filmmaker and podcaster. You can hear her as part of The Super 8-Bit Power Hour, and see her work as part of Cheesemint Productions here. Adam: One of the most engaging aspects of the MCU’s Phase One was the distinctive presentation of ‘character moments’. Whether momentous or seemingly throwaway, certain scenes, certain lines of dialogue gave audiences a degree of insight into how these silver screen interpretations of the characters would adhere to or diverge from their comics source material. But more importantly, puny pre-experiment Steve Rogers fighting back against bullies shows something of who he is, and begins to build a meaningful part of the character tapestry of this lovely, wacky universe. And, like any good soap opera, these moments sow the seeds for future interactions, relationships, dramas and tensions. Of the Phase 1 films, one of the strongest characters moments centres on Samuel L. Jackson’s Nick Fury in Avengers. Smearing blood on Agent Coulson’s limited edition Captain America trading cards and throwing them down before the reluctant Avengers squad drives the film’s plot into its third act, and proves a defining moment. Fury brings the team together, and marks himself out more or less forever by his choice of actions. It’s significant because what he does here is not heroic. Neither noble, nor honest, it’s actually very un-American. Instead, it’s calculated, strategic and emotionally manipulative. So without straying into grossly “grim & gritty” territory, we establish the grey areas of heroism, just as the heroes finally unite. Fury bears any moral cost unflinchingly. And that is Nick Fury, through and through. Adam Karenina Sherif is a musician, historian, comics critic and retailer. You can hear him on Comic Book Classroom and as part of th’sheridans.